Schedule Gutter Inspections. A faulty gutter system can lead to costly repair work, but you can easily prevent this by turning to a reliable gutter company for a professional inspection. A comprehensive checkup, especially after a major weather event, may uncover damage you generally won’t notice until it’s already too late. With an inspection, you can effectively deal with the damage before it worsens, ensuring your seamless gutters continue to function properly and efficiently. Invest in Gutter Cleaning Services. 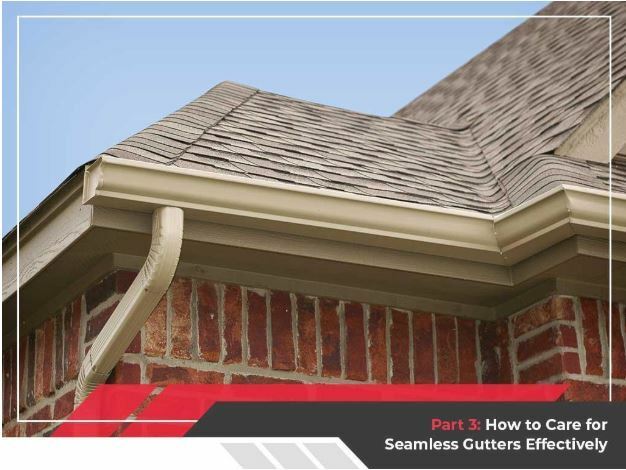 Seamless gutters aren’t as prone to congestion as sectional ones, but it can still happen. To keep your system’s smooth and clog-free performance, make sure to have it cleaned a couple of times a year. You probably already know just how much damage clogged gutters can lead to, not to mention the costly task of fixing them. With professional gutter cleaning, you won’t have to worry about leaves and other loose debris creating problems for your home. Just turn to a premier contractor who offers a comprehensive gutter cleaning contract. Aside from removing the pileup of debris inside your system, they can give it a low-pressure rinsing to get rid of dirt and grime buildup without damaging the gutters. Have a Gutter Protection System Installed. If you want a good alternative to gutter cleaning, you can invest in gutter guards instead. They help ensure your system remains debris-free while allowing it to function to full capacity. Not all gutter guards are the same, however. There are options that use mesh, brush or foam for the job. Some even have reverse-curve edge. A prime example of an effective gutter protection system is the Valor gutter guard. It has a sleek design, with an elevated, pressed stainless steel mesh pattern that breaks water tension even from high rain flow. This allows water to run smoothly through the system, while preventing debris from settling inside. The gutter guard’s S-curve design also ensures leaves and pine needles don’t stay on top of the cover for too long, reducing the potential for fire hazards. Standard gutter systems may be good enough, but seamless gutters are even better. With their sleek good looks, smooth performance and long service life, they are the best choice for every home, guaranteeing best returns on investment for you.